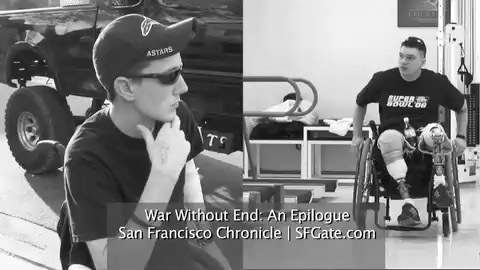 In a follow-up to Chronicle writer Joan Ryan’s 4-part series on wounded veterans Brent Bretz and Michael Buyas, video journalist James Irwin visited Bretz at his home in Arizona and Buyas at Walter Reed Army Medical Center and, together with Joan, found that both men were optimistic and determined as they struggled to overcome the many physical and emotional obstacles in their long pursuit of independence and mobility. This video report won a CINE Golden Eagle award in 2006. SYNOPSIS: At his home in Tempe, Arizona, 23-year-old Brent Bretz, is seen getting himself ready for an evening out on the town. Bretz shows some of his injuries, including the right leg stump that exhibits severe heterotopic ossification (rogue bone growth). Bretz shares a condo with his cousin, Jason Jones, who often drives Bretz in Bretz’ beloved black pickup truck. On this evening, the two visit Bretz’ mother, Kathy, before they head off for a night of clubbing… The scene shifts to Silver Spring, Md., where Michael Buyas is undergoing physical therapy at Walter Reed Army Medical Center. Buyas demonstrates how he has learned to get around on his two prosthetic limbs for extended periods out of the wheelchair. In an interview, he reflects on his feelings about his service and sacrifice in the line of duty.